Who is James R Kirk? Most people are familiar with the iconic James T. (Tiberius) Kirk from Star Trek. 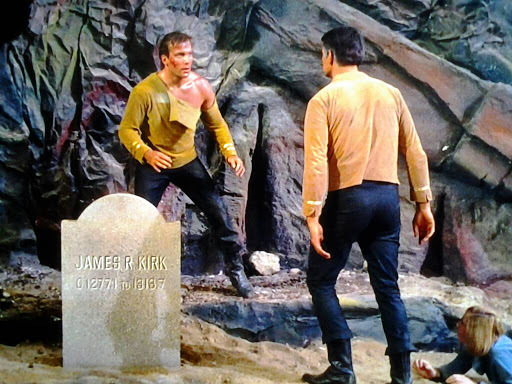 But in the original series episode "Where No Man Has Gone Before" a tomb stone is created for Kirk that shows his name as James R. Kirk. Who was James R. Kirk and when did his name change? According to D.C. Fontana in the introduction for Star Trek: The Classic Episodes 1, when the mistake over the middle initial was discovered, Gene Roddenberry decided that if pressed for an answer on the discrepancy, the response was to be "Gary Mitchell had godlike powers, but at base he was Human. He made a mistake." Found in the article on Where No Man Has Gone Before and in the section on "Sets and Props". Then the in universe explanation is that Gary Mitchell forget and the out of universe explanation is essentially Word of God, with the producers saying it's a mistake. James R Kirk is in fact James T Kirk. The out of universe explanation is that in that episode, there was a production goof. The in universe explanation is that the man who created that tombstone, Gary Mitchell, must have misremembered Kirk's middle initial. Everywhere else in The Original Series, he's referred to as James T Kirk. Other answers include that "James R. Kirk" was an in-joke between them (the "My Brother's Keeper" novel series), or that "James R. Kirk" was an alternate-timeline version of "James T. Kirk" (Q-Squared). Peter David had run with the idea that the slightly different uniforms and careers (Physicist Sulu?) of "Where No Man Has Gone Before" represented a parallel universe (called "Track A"). Explanations that the uniforms had changed soon after "Where No Man..." are contradicted by Kirk and Helen Noel's uniforms in flashback during "Dagger of the Mind". This episode was the second pilot for the series. The first pilot, "The Cage," was rejected by NBC. It was more than a year before it actually aired. By then, numerous changes had been made to the characters, storyline, costumes, and appearance of the Enterprise. I have heard that for the Blu-Ray release they actually considered changing the "R." to a "T," but decided against it. This is only one of many plot contradictions, errors, and continuity problems that appeared throughout the series' three year run. One interesting possible answer to this question can be drawn from a reference in one of the original line of Star Trek novels (which, albeit generally considered non-canon, where often written by people close to the original productions and may give some insight into original plans that were dropped, etc). In this case, the novel is The Galactic Whirlpool by David Gerrold, which includes a section explaining that "Tiberius" is not part of Kirk's given name, but instead is a nickname that was given to him by one of his Academy instructors and which he later officially adopted in order to remind himself of that instructor's lessons. If this is accepted as true, then it leaves open the possibility that "R" was the initial of an original middle name that he dropped when adopting the nickname. As some have already stated, this was just a mistake. If you watch more Star Trek TOS episodes you will find simular strange mistakes. For example in the Episode "Court Martial" which is in the 1st season also, Kirk makes a statement that the ships computer can be boosted to hear noises at 1 to the 4th power. Which of course is still one. In the Movie series Kirk is heard to say "Prayer Mr Saavik, Klingons do not take prisoners", yet they are heard a couple times referring to prisoners they have either taken or want to take. Sorry this went long but I just wanted to show some examples that they made plenty of mistakes making the TV shows and the movies, James R. Kirk just being one of the many. Which always makes for a good discussion. Back in their Academy days, Gary was Kirk's best friend, but the Barrier energy changed him. Maybe "R" stood for a nickname--perhaps "Ratface" or something cruel like that--given to Kirk by Finnegan! The upperclassman would definitely have pounced on Kirk's unusual middle name "Tiberius"! The altered Gary wanted to get under Kirk's skin and brought up that old painful memory. If anybody else has got a better explanation...go for it! LOL! It is possible that Kirk's full name was James Romulus Tiberius Kirk or James Tiberius Ronald Kirk or something and that Kirk preferred to be known as James R. Kirk until "Where No Man Has Gone before" and then switched to using James T. Kirk because he didn't want to be reminded of the tombstone created by his best friend. read on another forum that the R stands for Roddenberry, the guy claims his parents were involved in script writing and he owns some original notes from the time, apparently the Tiberius name was first coined in the animated series and is the only thing from this taken as canon. Not the answer you're looking for? Browse other questions tagged star-trek or ask your own question. James T. Kirk: Why “Tiberius”? When Did Vulcans Change from No Emotions to Buried Emotions? In Star Trek (2009), Did the Original Timeline Survive? Who was more of a Casanova , Kirk or Riker (based on count of bedmates)? Why did they not call it “Wagon Train to the Stars”? Is there any reference to intergalactic relations in Star Trek’s future? What consequences were there for Kirk in the TOS episode “A Private Little War”? Were The Original Star Trek Sound Effects Used Before Star Trek? What is James T. Kirk's ethnic background?